Team Unity emerged victorious in Friday’s preliminary election results, but for their opponents, the end of the election battle could be weeks away. 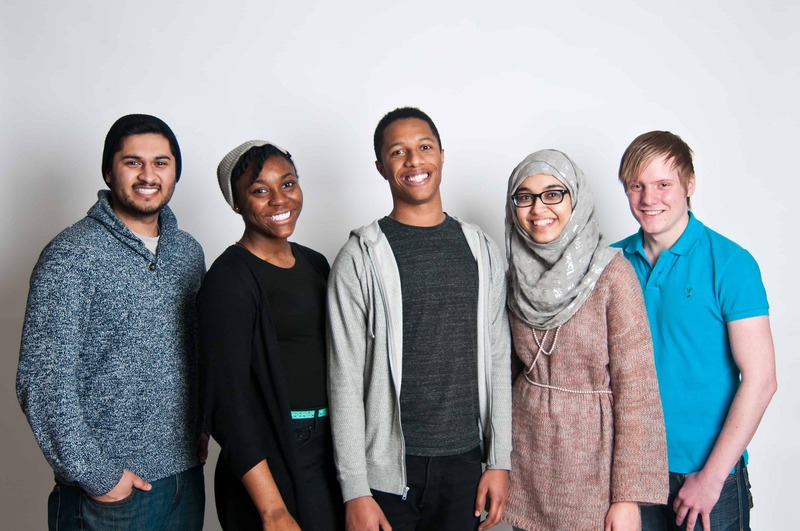 Current UTSU VP external Shaun Shepherd is set to replace president Danielle Sandhu. Independent presidential candidate Rohail Tanoli received slightly more votes than StudentsFirst candidate Brent Schmidt, but even with their votes combined, the two candidates would still have lost to Shepherd. The rest of Shepherd’s executive team was also elected by a wide margin. Corey Scott will return to his post as VP internal and services. The other newly elected executive members are Noor Baig (equity), Abigail Cudjoe (external), and Munib Sajjad (university affairs). Positions on the board of directors were split between Team Unity and independent candidates. Eight Team Unity candidates were acclaimed to their positions. After the UTSU elections’ highest appeal board, the Elections and Referenda Appeals Committee, reinstated Unity candidates to the race on Thursday night, Ali Mustafa Bello, Baliqis Hashiru, and Khalid Khan eked out narrow victories at New College. Non-Unity candidates, meanwhile, claimed victories at St. Michael’s College and Trinity College. Though Team Unity won the election, it has emerged battered and openly derided in arenas of student politics like Twitter and Facebook. One Facebook note posted by Team Unity during the campaign attracted over 100 lengthy, angry responses. Following the lead of a fake Twitter account used to censure opposition figure Brett Chang, several other fake accounts cropped up over the week to mock everyone from StudentsFirst to Team Unity. Even though the ballots have already been counted, discontented opposition supporters who allege that the election was conducted unfairly continue to lodge formal complaints with the CRO. A significant backlog of these complaints, appeals, and re-appeals could mean that a final conclusion to the events of the campaign may be weeks away. Although they continue to seek resolution through established means, the opposition is also taking matters into its own hands. Following their initial frustrations with the decisions made by chief returning officer Daniel Lo, opposition supporters have been compiling a databank of evidence pointing towards alleged infractions overlooked by Lo. On Saturday night, they began to leak their evidence through a Facebook page created for that express purpose entitled “Unity Dirty Tricks.” The group had existed briefly during the campaign but was taken down over fears that Lo would penalize StudentsFirst candidates already teetering on the edge of disqualification. Several opposition supporters who contributed to the databank speak optimistically about an outcome similar to York University’s in 2010. When those elections were mishandled, so many students complained that the administration stepped in to compel the union to implement electoral reform. So far at U of T, however, the administration has been hesitant to involve itself in the affairs of the student union. Meanwhile, for the candidates, the end of a grueling election season comes as a relief. The former three presidential hopefuls, Shaun Shepherd, Brent Schmidt, and Rohail Tanoli, have plans to meet up this week for a friendly round of drinks — for them, perhaps an opportunity for a final denouement to the drama of the campaign trail. In a dizzying turn of events, 22 Team Unity board of directors candidates were briefly disqualified Thursday, then re-qualified hours later by two separate election committees. Though the disqualified candidates won their seats the next day, the controversial rulings brought both committees under close scrutiny. The Elections and Referenda Committee (ERC) overturned rulings made by embattled chief returning officer Daniel Lo Thursday morning, leading to 21 demerit points across the board to Team Unity. The swath of demerits given to the slate meant that as polls remained open Thursday, 22 of their 26 candidates were technically disqualified. The threshold for disqualification for most board of directors (BOD) positions is 20 points, while at-large candidates require 30 points and executives 35 points. All disqualified members were running for BOD positions. Unity was punished for making misleading statements on the campaign trail. The committee found the slate’s claim of having increased clubs funding false as it actually decreased by more than $5,000. Also, the ERC proclaimed that Unity didn’t “[win] an interest-free period on OSAP for 6 months after graduation,” unlike what was stated on their website. The interest-free period was introduced before the current UTSU executive’s term. Clara Ho, current UTSU VP university affairs and chair of the ERC, promised Wednesday that a full and impartial review will be granted to all appeals issued against Lo’s rulings. “I will let the rulings speak for themselves,” said ERC chair Clara Ho before the rulings were released. Hours later, the Elections and Referenda Appeals Committee (ERAC), the election’s final court of appeal, reversed the decisions and welcomed candidates back into the race. No explanation has been offered for the radically different findings issued by the two committees. Ho stressed that “different bodies may have different interpretations,” and that time constraints during the election meant that imperfect decisions would sometimes be made. “I would certainly agree that some rulings could benefit from further investigation,” Ho said. Some cases brought before the CRO have, in fact, remained “under investigation” as late as Sunday. The five ERAC members who ultimately restored candidates to the race have come under close scrutiny by opposition supporters. This year’s committee included Ho as a non-voting member and chair, Graduate Student Union VP external Daniel Vandervoort, Arts & Science Student Union president Katharine Ball, and Ryerson Student Union (RSU) membership coordinator Casey Chu Cheong. “We have already begun looking into the backgrounds of the two non-UTSU members of ERAC, and what we’ve found out has been deeply unsettling,” said Jake Brockman, a third-year Trinity College student and member of the Arts & Science Faculty Council. Daniel Vandervoort allegedly arranged for the billeting of protestors in 2010 during the G20 protests. Police later raided the GSU building, arresting approximately 70 people, some of whom were allegedly involved in destructive “black bloc” activities. Cheong, meanwhile, oversaw the hotly contested 2010 elections at York University as chief returning officer. Following a flood of student complaints, York university administrators initiated a formal investigation into the election. The final report concluded that the appeals process overseen by Cheong “lacked due process,” and expressed serious concerns over numerous conflicts of interest in the elections process. During the meeting, ASSU president Katharine Ball was reportedly absent. “It would have been valuable to have all members present,” Ho said. In a statement, Ball said she regretted being unable to attend. “I support the rulings made, although I regret that I could not be there to be the voice of reason that I usually am,” she said. These developments have fueled a chorus of voices on campus who have been outspoken in criticizing the handling of this year’s election. On Friday, concerned students confirmed that they were investigating how best to formally involve the administration. With this year’s Governing Council election coming to a close, past student governors are questioning the impact of student votes in the council. Having eight students out of a 50-member council makes it difficult to effect major change on any front, said James Park, speaking from first-hand experience on the council in 2010–11. “Sometimes we would get a few of the alumni or administrative staff governors supporting us, but in the end the votes were never close,” he added. According to Park, a weak electoral mandate and pervasive apathy towards which students sit on the council, or what they do, can also be an issue. 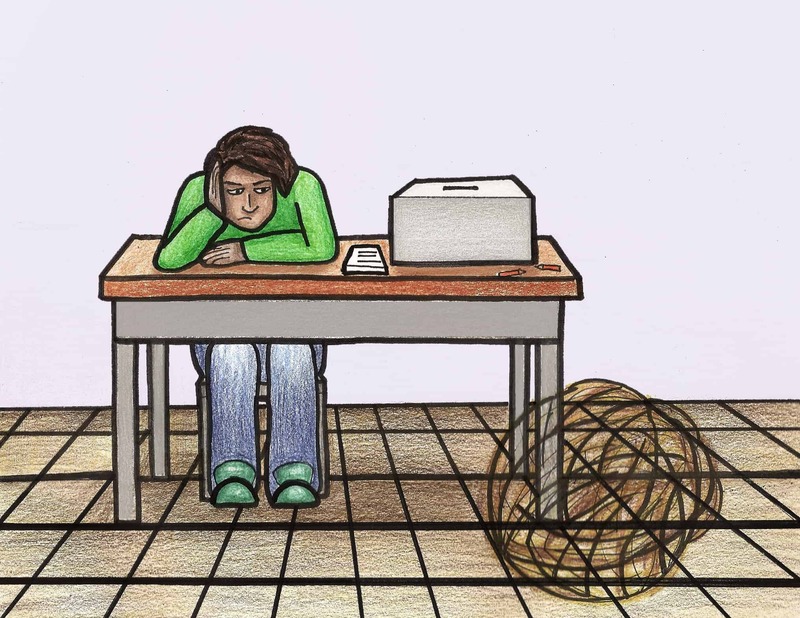 Last year, only 7.6 per cent of students voted in the full-time undergraduate constituency, while 5 per cent voted for the part-time undergrads. Appointed student governors who few people voted for have a difficult time claiming a mandate for change, Park said. This year, three student governors will be acclaimed to their positions, running unopposed in their constituencies. “By the time new student governors learn about the protocol, half of the year is gone,” Kim said. External appointees to the Governing Council serve for three-year terms, while staff and alumni often serve for successive one-year terms. Spending many years on the council, these governors are generally more familiar with policies and governance, explained Kim. Richard Nunn, for instance, was first appointed to Governing Council in 2004. He serves today as the council’s chair. Nunn pointed to the most recent Governing Council meeting, where student governors’ lobbying about U of T’s new copyright agreement won it a space on the agenda for discussion. This, to Nunn, is an example of student-led change. Although the copyright agreement eventually passed despite student opposition, Nunn said this is an example of the contributions student governors make on a regular basis: raising new issues, highlighting things that are of concern to students, even if they are not always successful when it comes to votes. Student victories on council, however, have not always been so modest. In 2007, a proposal to build a Student Commons that would revitalize campus life was championed by student governor Estefina Toledo. The proposal received overwhelming support from the council. This success took years to cultivate, however, and relied on the vocal support of not only students but also ranking members of the administration. Five years on, a generation of undergraduate students has passed through U of T, and ground has yet to be broken for the construction the Stdent Commons. Members of CUPE 3902 Unit 1 ratified the February 24 agreement with the university Wednesday, preventing a strike of almost 4,200 union members. Sixty-seven per cent (1197 members) were in favour of the agreement, while 600 voted against. 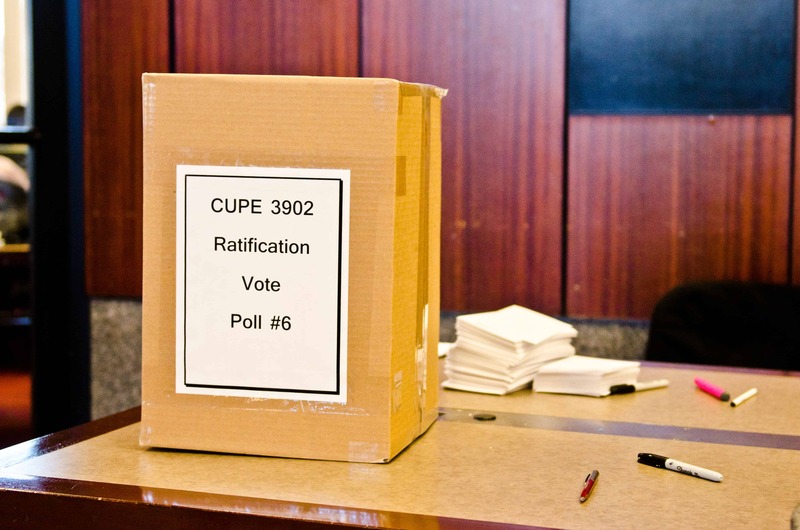 In comparison, CUPE’s last ratification vote in 2009 garnered a 97 per cent voter support. Despite the ratification, some members’ frustration over the negotiations’ non-transparency continues. Some said that accepting the deal would jeopardize future negotiations. “I think the agreement is a quick fix that can have really negative long-term consequences,” David Seitz said. The university, on the other hand, was pleased with ratification but acknowledges that it was no walk in the park. While the majority of the vote took place on Tuesday and Wednesday, voting began right after a CUPE meeting that took place in Convocation Hall on February 24. The opening of polls in all three campuses was stalled due to a mandatory seven-day notice requirement. Some members expressed their frustration at the confusion that this caused since they were unsure if they would be required to vote again. Stephen Trochimchuk felt that voting right after the meeting was not a good idea due to high emotions. “Emotions are high; people were really frustrated with how long it was taking. It seemed more appropriate to have some time to leave the meeting, go home, and think about the agreement then vote,” he said. Under the new settlement, the university will establish a working group to look into ballooning tutorial sizes. In place of the Doctoral Completion Grant, it will also allot $250,000 for unfunded fifth- and sixth-year grad students for the next two years. Lastly, U of T will give graduate students two one-time payments totalling $150,000 to compensate for increased workload. Further details of the deal can be viewed on the union’s website. The deal will last nearly three years and will expire on April 30, 2014. CUPE officials were reached for comment but had not provided The Varsity with a statement as of press time. With files from Maclean’s and The Gazette. During a Quebec-wide post-secondary school boycott Monday, The Gazette reported on Concordia University’s review of money paid to senior employees who recently left their jobs. An email to the university obtained by The Gazette revealed that five administrators who left around September 2009 to December 2010 were paid $2.4 million in severance. Former president Judith Woodsworth was also paid $703,500 in severance while her predecessor Claude Lajeunesse received $1 million. Concordia is planning to bring in an outside team to reassess the termination process of senior officials. With voter turnout for this year’s UTSU elections hovering just above the 10 per cent mark for the second year in a row, some students feel improvements should be made to increase university-wide involvement prior to election dates. Only 4,500 students — 10.5 per cent of UTSU members — cast votes this year, a little over last year’s participation. According to statistics from the office of chief returning officer Daniel Lo, 2011’s voter turnout was 10 per cent, an eight per cent drop from 2010’s. “It’s a little bit sad. I think there’s just too much apathy at this school which is a reason why change is so hard here,” said second-year student Anthony Botelho, who placed a vote last week. Aishwarya Gathwala, a first-year student living on residence, said that though she voted, she was only informed of candidates’ election platforms by a campaigner she knew as she walked into Sidney Smith Hall. “Many students like me didn’t know it was going on,” she said. Second-year Francine Ricknauth, on the other hand, didn’t cast a ballot because she didn’t know enough about the issues. All three students agreed that increasing advertisements with emails, posters, and lecture announcements would improve voter turnout. “I don’t think [the advertisements] are enough. Something should be done so that everybody knows this is going on and everybody gets involved,” Gathwala added. UTSU president Danielle Sandhu said that the Elections and Referenda Committee serves to make polling stations more visible across the St. George campus, but unlike other universities, U of T is at a disadvantage as it doesn’t have a student centre to act as a central student hub. Sandhu, however, mentioned that voter turnout depends on the amount of work put in by candidates. Because the university’s administration is responsible for informing members of election dates on the UTSU’s behalf, Sandhu noted that without having access to its own membership list, students couldn’t be reached as actively and as frequently as they would like. “More broadly, I think we need to a see a shift in political culture, where all students see themselves as capable of social change, and engage in political issues throughout the entire year, including election season,” she said. Some universities across Canada have reported higher voter turnout figures than U of T’s. After University of Western Ontario’s (UWO) first election was rendered invalid due to a hacking incident, the Gazette reported a 42 per cent student participation in the repeated election. Voting for UWO’s election occurs online. The McGill Tribune, meanwhile, wrote that 21 per cent of students had participated in voting for the Students’ Society of McGill University (SSMU). This year, University of British Columbia’s student union experienced a 0.6 per cent increase from the 11.6 per cent participation in their 2011 election according to The Ubyssey. With files from The Chronicle Herald and Maclean’s. Eighty-three per cent of Dalhousie’s faculty association voted in favour of a strike Thursday. Over 800 professors and support staff at Dalhousie will walk off the job if a deal isn’t reached by Monday. The university’s pension plan is the chief source of disagreement in this round of bargaining. University officials want to make Dalhousie faculty partly responsible for budget shortfalls. The university’s pension fund faces a shortfall estimated at $40–50 million per year. Hoping to avert the strike, Nova Scotia’s cabinet is temporarily waiving pension plan solvency regulations for the province’s universities, saving administrators from cutting funding or pensions. Ryerson won against U of T in an inaugural foreign policy student debate held at Ryerson University Thursday. Hosted by the Canadian International Council Toronto, the debate was about the decline of Canada’s influencing role in the world. Ryerson’s Jake Brunt and Macey Cohen argued in favour of the resolution, while U of T’s Sam Greene and Jake Brockman opposed. The judges, faculty members Arne Kislenko, Linda Goldthorp, and Robert Teigrob, declared Ryerson the winner, despite being impressed by both sides. All three judges are renowned scholars of international relations. Brunt argued that there exists a disconnect between Canada’s rhetoric and action. “Canada has the potential to be a key player in the world, but it’s all based on speculations,” he said. Cohen added that the country used to be at the heart of important organizations like the International Monetary Fund and the United Nations, until its influence gradually declined in the 1990s. As evidence, she pointed to Canada’s lost bid to occupy a UN Security Council to Portugal and Prime Minister Stephen Harper walking away from the Kyoto Protocol. On the other hand, Greene said that Canadian ideas are shaping the world. In support of Greene’s claim, Brockman listed events when foreign countries looked up to Canada, for example. “Canada has a powerful constitution that is shaping other countries’ constitutions,” he said, citing Israel’s basic laws and the Arab Spring when countries followed Canada’s lead. The speaker of the house, Jo-Ann Davis, moderated the debate’s question and answer portion. The house overwhelmingly voted in favour of the resolution, as they felt Canada’s global influence through documents such as its constitution was actually negligible. Next year’s debate will be held at Hart House and will once again be between U of T and Ryerson. Semra Eylul Sevi is a former Hart House debater.